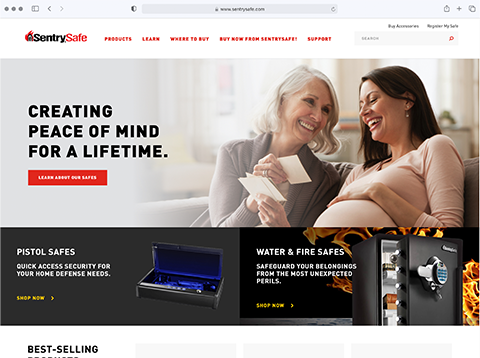 For over 80 years, Sentry®Safe has been the world leader in fire-resistant security storage, committed to innovation and dedicated to delivering exceptional customer service. We're proud to provide customers around the world with solutions as unique as their individual needs for affordable security and priceless, peace-of-mind protection for the important and irreplaceable. We offer the best fire protection in the business. Our Safes can withstand temperatures ranging from 1,150° F to 1,850° F. We're also proud to offer different levels of waterproof and water-resistant technology to ensure your most treasured valuables are unscathed by flooding, violent storms and other causes of water in your home. The Sentry®Safe ETL verified waterproof guarantee ensures that items you place in your Sentry®Safe Fire-Safe® Waterproof chest or file will remain dry even through extreme exposure to water. Many of our products also pass rigid UL testing requirements for impact resistance and explosion hazards. Our safes come complete with many different lock types designed for different levels of security and convenience. These include privacy key locks, 3 number programmable combination locks, electronic keypad locks, and card swipe locks. These come on safes of many different styles and capacity which are perfect for protecting passports, paper documents, spare keys, family photos, jewelry, collectibles, guns, hunting accessories, medical records, bank files, cash, credit card records, business records, CD's, DVD's, USB drives, memory cards, and portable hard drives.